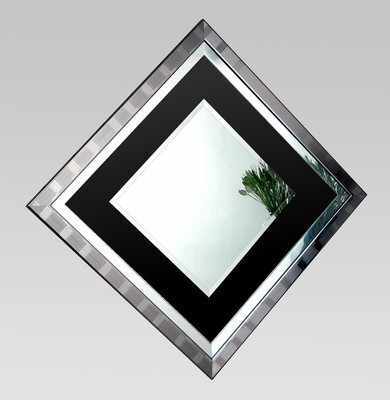 Xena mirror a pewter and polished chrome effect frame, with a bevelled mirror mounted on a black glass back. Overall size.112x112cm when hung diagonally. Xena mirror pewter & polished chrome effect frame with a bevelled mirror mounted on a black glass backing. May be hung squarely or diagonally. Also available with red or clear glass backing.